Located on the southern tip of Canada's Vancouver Island, Victoria, British Columbia, has a temperate climate, but is susceptible to cold snaps. Sitting on the edge of Pugent Sound, the area is also influenced by the coast. Victoria is well known for its stunning floral displays in spring and fall, and is home to Butchart Gardens, a Canadian national historic site. Its growing season is relatively short, making it a good spot for cold-weather fruit trees, including stone fruits. Winter temperatures in Victoria can drop as low as -7 degrees Fahrenheit. Many varieties of apples grow well in Victoria, including the McIntosh (which originated in Ontario), Braeburn and Gala. Because Victoria is a coastal area, it is important to check the chill requirements for apple varieties, as the climate is more temperate than the rest of Vancouver Island. Gala is among the apple varieties that can thrive in Victoria, but not inland. This apple has skin that is red over yellow with firm, sweet, juicy flesh, but it does not store well. McIntosh and Braeburns have a longer shelf life and are more tart. Apple trees should be planted in full sun and require regular water as fruit grows. A member of the Moraceae family, figs grow best in a Mediterranean-style climate, with mild winters. These trees have heavy, gray bark that may become gnarled as the tree ages, while foliage is bright green with the texture somewhat like sandpaper. Figs are small, soft brown-purple, pear-shaped fruits, and most trees will produce a harvest in mid-summer and again in mid-fall. In coastal Victoria, fig trees may be planted in a home landscape, but in the interior of the island, they should be protected against sub-freezing temperatures and frost, as too much cold weather will cause the tree to die back and perform more like a small shrub. 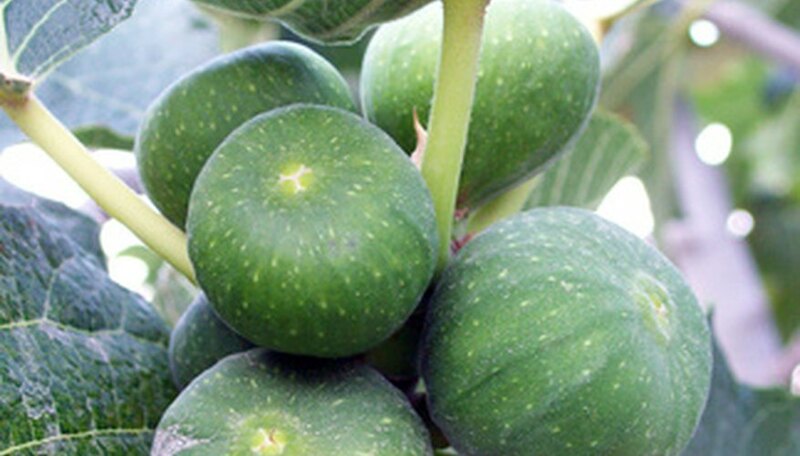 Fig trees should be planted in full sun and require regular water. The so-called European varieties of plums (Prunus domestica) grow well in Victoria's mild climate, producing heavy harvests from June to September, depending on the variety. These plum trees bloom later in the spring and are less prone to frost damage than the Japanese varieties. 'Green Gage' and 'Sugar' cultivars are particularly good eating plums. 'Green Gage' is an heirloom variety that has green-yellow skin and ripens in the middle of the season, while 'Sugar' is a dark blue-purple fruit that is very sweet and ripens in late June or early July. Plum trees should be planted in full sun and require regular water, including deep soakings to keep roots moist.